The Chairman of the World Council of Rusyns Paul Robert Magocsi from Toronto accepted the invitation and participated in the first meeting of the preparatory committee which took place on June 18th, 2008 in the Office of Rusyn and Narodny Novinky, which is also the centre of other Rusyn organisations. The committee is in charge of organising the First World Rusyn Costume Party to be held on February 28th, 2009 and will fill up the whole building of the Dukla Hotel in Prešov. The ball is supposed to be Rusyn not only by its content and form but also a surprise for those who decide to come. In the picture, the participants of the meeting can be seen (from the left): P. R. Magocsi, Anna Servická, Stanislav Stanislav, Michal Repčík and Valéria Fürješová. The committee also includes the following members: Alexander Zozuľák (the Head of the Committee) and Ivan Kopor. Everybody can come from any part of the world as accommodation will also be provided in the above-mentioned hotel for all those who show their interest in attending our ball in advance. WE ARE LOOKING FORWARD TO SEEING YOU AT OUR BALL. The 1st international Congress of the Rusyn Language was organised with the initiative of the World Congress of Rusyns and held on November 6th – 7th, 1992 in the Spa of Bardejov. The Rusyn Revival of CSFR (Czechoslovak Federal Republic) and the Carpathian-Rusyn Research Centre of the USA were the main organisers. The congress was also supported by the Swedish Academy of Stockholm, the Romanche League of Switzerland and the Academy of Dialects of Monaco. Its aim was to coordinate the initial work in forming the standard Rusyn language. The congress ran in two sections: academic/research and practical. In both, significant well-known Slavists, sociologists and historians talked about the experience of other nations with codification. Using the words of Professor Alexander Dulicenko from Estonia, twelve points of the Resolution from the 1st language congress made it evident that Rusyns can take a similar way to the one of almost forty-thousand strong nationality of Ret Romans, who, over fifty years, used six variations of standard language and all of them were also taught at schools. On their basis, in 1982, a common standard language rumantsch grischun was formed, and in 1996, became the fourth official language of Switzerland, alongside German, French and Italian. Standard Rusyn language should have formed analogically, on the basis of colloquial variations of the regions (states) where Rusyns live, each of them separately at the beginning; but, gradually on their bases, one common standard global Rusyn language should be formed. As the outcome of the congress and the work of linguists and journalists of the editorial office of Rusín and Ľudove Noviny, the codification of standard Rusyn language of Slovakia was ceremonially announced on January 27th, 1995 in Bratislava; having its own orthographical rules, an orthographical dictionary, a dictionary of linguistic terminology and the first primer and reader. After last year’s series of events entitled Meetings with the Mother Tongue, which took place in Kolbovce, Medzilaborce, Ruska Poruba, Snina, Pčoline and Stakčín, the main organiser of which was the Rusyn Civic Association and the Ľudové Noviny Press; a new series of these events started in 2006. The first one took place in the Primary School in Šarišsky Štiavnik, in the Svidnik district on February 23rd in cooperation with the Methodological-Pedagogical Centre in Prešov. 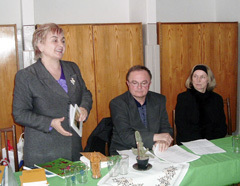 At the Meeting with the Mother Tongue in the Primary School in Šarišsky Štiavnik (left to right): the Rusyn writers M. Maľcovská and Š. Suchý, the Principal of the school M. Červeňáková; and I. Malačinová and R. Bilý – the presenters of the pupils’ cultural programme. In the foyer of the school, where the event took place, the Principal of the school Mgr. Mária Červeňáková welcomed the guests from Prešov: the writers PhDr. Mária Maľcovska and Mgr. Štefan Suchy; a popular interpreter of Rusyn folk songs Mária Mačoškova and the accordionist Jozef Piroh, as well as Mgr. Alexander Zozuľák, the editor-in-chief of „Narodny novînki“ (National News) and „Rusyn“, the editor in charge of the Rusyn non-periodical issues and textbooks . After the initial hymnal song „Ja Rusyn byl, jesm i budu...“ (I was a Rusyn, I am one and I will be…), A. Zozuľák spoke first. He presented the results of the Rusyn editorial activities and then pointed out the possibilities of the Rusyn language and culture teaching at Primary, Secondary and High Schools as well as universities. He emphasised the new opportunity to study this subject in combination with 12 different subjects within the bachelor form of studies at the University of Prešov, which is being opened in the academic year 2006/2007. He said that, after graduation from the studies of the above mentioned subject, there is a possibility to get employed in various institutes and Rusyn organisations and, especially, at schools. He said he was delighted that a lot of parents realised there is no need to be ashamed of their mother tongue and their Rusyn nationality; but, on the contrary, they should be proud of that and also guide their children in this direction. This is what a number of Rusyn parents from Šarišsky Štiavnik and Beňadikovce are doing, as their children attend lessons of the Rusyn language and culture. He was surprised that six Slovaks from the village of Radoma also study Rusyn at the Primary School in Šarišsky Štiavnik. They also learn lovely Rusyn songs, as we could hear later in the varied cultural programme, which was prepared under the leadership of the teachers, especially the teachers of Rusyn language and culture – Mgr. Mária Bakova and Mgr. Monika Sakarova and presented to the guests from Prešov as well as the attending parents and grandparents, who were very pleased by the performance, which was confirmed by a thunderous applause. After A. Zozuľák’s speech, M. Maľcovská (an editor of „Rusyn“ and „National News“) and Štefan Suchý (a methodologist of the Rusyn language and literature from the Methodological-Pedagogical Centre in Prešov) – the laureates of the prestigious Aleksander Dukhnovich Award for Rusyn literature presented excerpts from their literary works. Afterwards, a varied cultural programme made up from presenting, reciting and singing, naturally in Rusyn, as well as dancing took place. The following pupils participated at the programme: Ivanka Malaničová, Rasťo Bilý, Zdenka Vaňková, Nikolka Jaroščáková, Katka Ivančová, Erika Hadzimová, Vladka Lesňáková and Štefánia Fečová, as well as the choir of 26 pupils of 1st – 4th grades. The programme pleased all the attending. 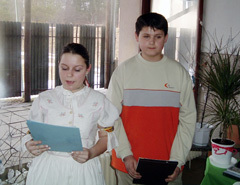 Those of us, coming from Prešov, were also pleased by the fact that from 65 pupils at the school, 26 pupils of the 1st – 4th grades study Rusyn as a compulsory subject – their mother tongue – and 20 pupils of the 5th – 9th grades learn the language in study groups; which is a shame – it would be more gratifying if the subject was also compulsorily taught. And we are getting close to the end of the Meeting with the Mother Tongue, when M. Mačošková with J. Piroh’s accordion accompaniment successfully performed. With their every song, the applause became more and more clammering and finally, M. Mačošková singing with the talented pupils, the members of the school singing group under the leadership of Ing. Ján Majer was the gala finale of the event. The popular interpreter of Rusyn folk songs M. Mačošková and the accordionist J. Piroh with some members of the singing group – pupils at the Primary School in Šarišsky Štiavnik, whose performance was the final gala of the cultural programme and the whole event. 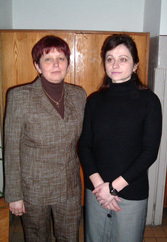 On the right: the teachers of the Rusyn language and culture at the school – M. Baková and M. Sakarová. The grandiose ending as well as the whole event will surely be remembered by every participant. We all left for home with a nice feeling that the school is being renovated and that, in accordance with the Rusyn spirit, the Rusyn language and culture are taught. It can be seen that the school’s pedagogical staff, under the leadership of their new principal, is trying hard. An interesting meeting of members of the Alexander Duchnovič Society took place on 17th October 2005 in Užhorod with the participation of the foreigner guest Steven Chepa from Toronto, whose Rusyn father was born in the village of Malyj Brereznyj in Subcarpathia and Rusyn mother in Lemkovina. Although S. Chepa was born and is presently living in Canada, he speaks the Rusyn language, he identifies himself to be Rusyn and he tries to do as much as he can for Rusyns. As the president of the big Canadian company Norstone Financial Corporation in Toronto he sponsors many cultural events of Rusyns in Europe and we do highly appreciate mainly the fact that he does support not only the development of Rusyn literature, culture, further education in the field of Rusyn studies by means of interships at University of Toronto, but moreover he does back up the publishing of school textbooks and opening and activity of Sunday schools of Rusyn language in Subcarphatia. And he performs more other activities for Rusyns with all his heart and on the basis of his warm relation to his Rusyn nation. Due to these reasons many people took part in the meeting with the guest of honour in the Alexander Duchnovič Society. Not only the members of the society were present, but as well common Rusyns who had an interest to see the greatest Rusyn maecenas S. Chepa who during his visit in Užhorod in June 2005 promised to help to reconstruct the building of Alexander Duchnovič Society at Pravoslávne nábraží No. 21 which would serve for the activities of Rusyn organisations and clubs and at the same time that would be a place for publishing of Rusyn weekly and for opening the Sunday school of the Rusyn language etc. Rusyns welcomed the initiative yet some of them have their own ambitions and thus they started to misrepresent S. Chepa’s words, as for instance former chairperson of the Alexander Duchnovič Society Ludvik Filip and the “lawyer” Petro Hoďmaš began to act against it in press. Let’s turn our attention back to the meeting. The atmosphere among normal, nationally aware Rusyns was congenial, because V. Chepa’s behaviour was also normal, spontaneous and he answered all the questions of the present guests and he as well confirmed, that in spite of all unfavourable people he would help to renovate the Rusyn National House in Užhorod. He stated that he would support the effort of the new management of Alexander Duchnovič Society and at the same time he would support the return of the highest possible number of people to Rusyn culture and traditions, especially young members of the society and Rusyn youth in general. Consequently, member’s meeting of the Alexander Duchnovič Society took place on 22nd October 2005 in Užhorod, at which the work of society management headed by L. Filip was strictly considered. Valerij Paďak and Vasyľ Cugo, members from the former management, were shown the trust by the society members, and they remained the management members. Vira Bahanič, Dimitrij Pop, and Rozalia Dumnič became the new management members. V. Paďak was elected to the position of chairperson.